The test pressing was made after the Nirvana catalog was transferred from Original Recordings Group to ORG Music, which seems to have been formed in late 2010. This is the second pressing on any of the ORG labels, or the first ORG Music pressing. The same generic labels were used on both sides. The test pressings came in white inner sleeves with a sticker in the upper right corner. The second number on the sticker is the internal pressing plant job number, which is also found in the matrix codes. "Stückzahl" is German for quantity. The lacquers were cut in 2009 at Bernie Grundman Mastering . Whether "BG" in the matrix codes identifies Grundman personally as the cutting engineer or the company in general, is unknown. The cutting engineer also wrote the catalog numbers. Both these parts are handwritten. The pairs of fathers and mothers were processed by Record Technology Incorporated (RTI) in the USA , which added, handwritten, "18200.1/2(3)" to the lacquers before plating them. The number is their internal job number, and also specifies the plating process, the three-step process . RTI also processed stampers and pressed the first pressing records, with matrix codes containing the three parts just mentioned. ORG Music was formed some time in late 2010, and they replaced RTI with Furnace MFG for their vinyl orders . Furnace subcontracted the production to Pallas Group in Germany. This partnership is referred to as Pallas USA. The original pair of mothers, or a new pair made from the original pair of fathers, was then sent to Pallas. Pallas stamped their internal job number, "21919", and "P. USA" onto the mother plates. The rest of the matrix codes are obviously identical to the first pressing by RTI. A third pressing was done in 2011. 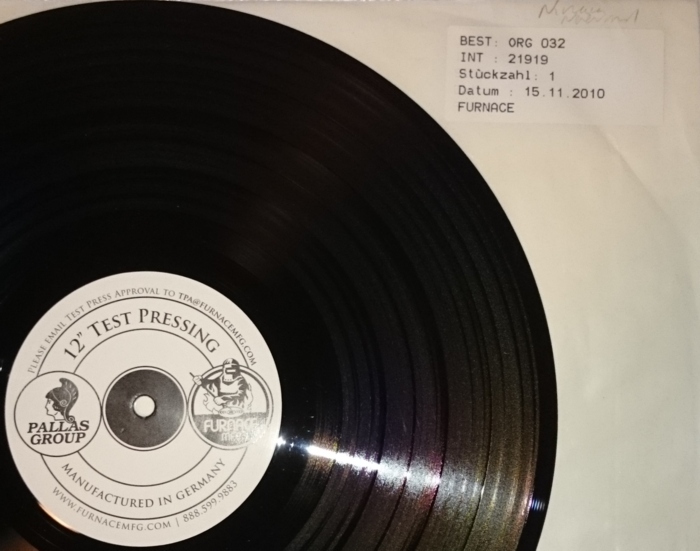 The test pressings are identical, and can only be told apart by the dates on the sleeves.